"It's the most wonderful time of the year!" Sing it with me! Ok, so I know that is a winter season song, but really who likes winter? It's cold outside, all of the trees are dead, it gets dark early. Boo! Everyone knows that fall is the most wonderful time of the year. Beautiful trees, crisp air, and lets not forget the pumpkins! Mmmm pumpkins! They can be turned into so many yummy treats. So since I am in such a festive mood I decided to make cookies, and I'm going to to share some with all of you! 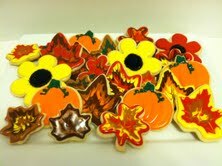 I made these vanilla sugar cookies with pumpkin spice icing in festive fall shapes to share my love of the season. So, now I want to share that love with you! 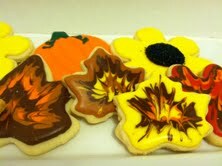 I will give away one dozen fall cookies (2 flowers, 2 pumpkins, and an assortment of leaves) to one of you to share with your family and friends, or hoard them all for yourself. It's up to you. They will come dressed in pretty fall themed bags too! Leave a comment on the blog telling me what you like best about the fall season. Become a follower of the blog and leave a comment letting me know. Become a follower on FB and leave a comment letting me know. Leave a comment for each separate entry. Comments must be left on the blog in order to be entered to win. (Comments left on the FB page will not be counted). Make sure you leave me a way to contact you. If I cannot contact you, then you cannot win. This giveaway is for the US only. Contest ends September 26th @ 12am EST. I love caramel apples in the fall. Would love to have the cookies! Oh, and Sam, this is Kristen, since apparently my google name won't link to my email - klozinak35@gmail.com. Good going, google. You really know how to impress me! Mmmm just stumbled upon your site. 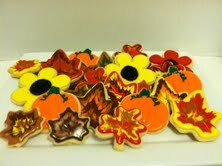 I would love some fall cookies. I love the colors of fall. What I like about the fall is the weather warm during the day but cool @ night so that you can have a fire with hot apple cider. I like the changing colors of nature,pumpkin muffins, apples and Halloween. I don't think there is anything about fall that I don't like!!! Love your blog and cake ideas!! You are so creative!!!! Football Season and Giveaway Winner!